Nestled in quiet Lakeland Ridge community in Sherwood Park this wonderful home is sure to impress! Surrounded by everything you need including major retail and grocery stores and various parks and schools makes this is the perfect place to call home! Plus, it's only a 20-minute commute to Downtown Edmonton!! The home itself offers over 2000 square feet of living space and offers everything from a built-in vacuum to massive backyard complete with a large wood deck. The main floor of this executive two-storey offers a massive kitchen boasting maple cabinetry, a large island with breakfast bar, ceramic flooring and a corner pantry closet! Plus, the kitchen offers stylish black appliances including a large fridge, a stove, a built-in microwave and even a dishwasher! You'll love all the space this kitchen offers! The kitchen even overlooks a small sunny breakfast nook! Off the kitchen you'll find a large formal dining room as well as a large family room complete with hardwood flooring and a gas fireplace! The upper level features three spacious bedrooms with the master offering a large walk in closet and a stunning four-piece ensuite bathroom complete with a large soaking tub and neo angle shower! A huge bonus room, perfect for a theatre space or extra play room as well as another full bathroom complete this wonderful level. The basement level is entirely unfinished and perfect for storage, a work out space or even more play area! 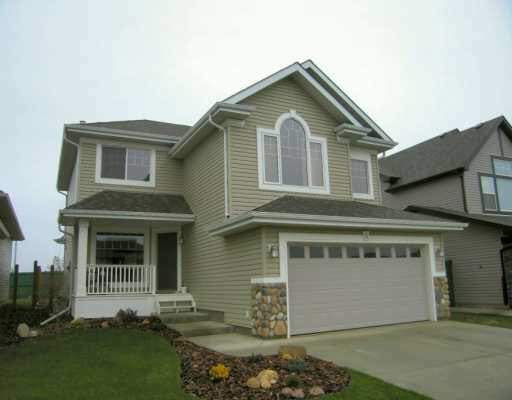 Enjoy a double car garage, as well as a partially fenced yard with a huge deck! Entertaining guests will never be easier! Small dog will be considered.